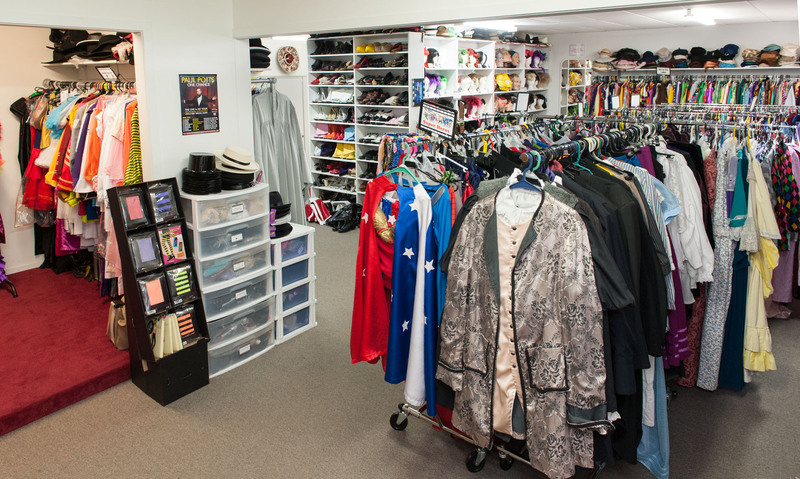 Gowns for the ladies and top hat and tails for the gents. This 18th century maids dress with small blue floral is open at the front with a frill bottom petticoat underneath. Add to this a bonnet to complete the look. 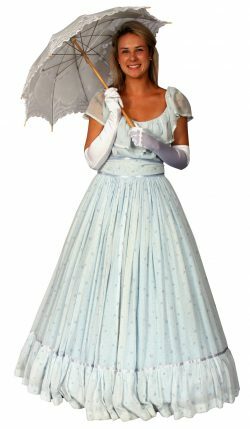 Mary Poppins long white chiffon large frilled gown. Add a parasol and lace gloves. Straight out of a foggy lane in London town, the Midnight Stalker. 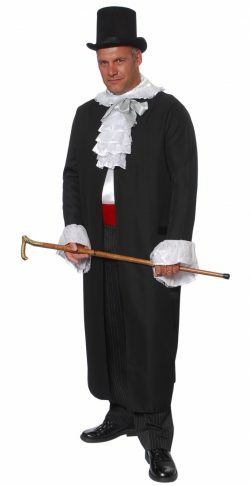 This costume includes the jacket, frilled neck piece, sash and top hat. Also a popular choice for a Halloween costume. 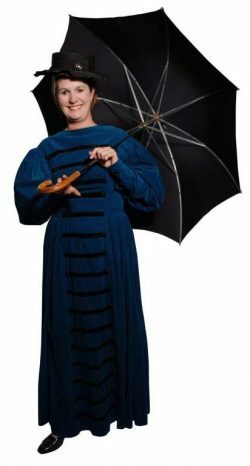 Mr Darcy character costume with blue tails jacket, shirt with neck ruffle, waistcoat and pants. A very popular figure from Pride and Prejudice. Black bustled Victorian ladies long skirts which look great for the era when teamed up with a fitted jacket, either coloured or black. 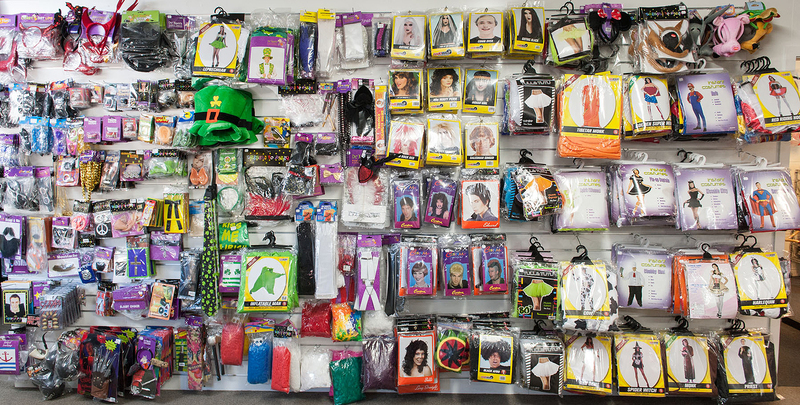 Add some gloves and a character wig to complete your look. 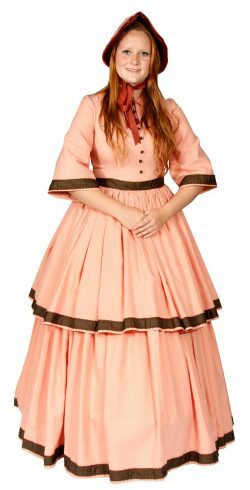 This Victorian dress has leg of mutton sleeves and velvet and button detail down the front. Add gloves and a character wig to complete the look. 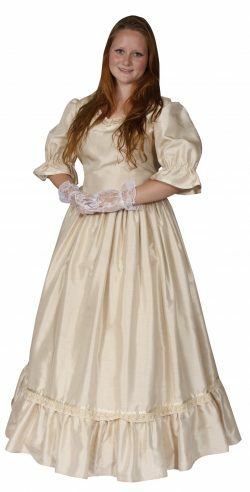 Apricot Victorian dress with brown trims comes with matching bonnet and crinoline. Black Victorian satin dress with crinoline. 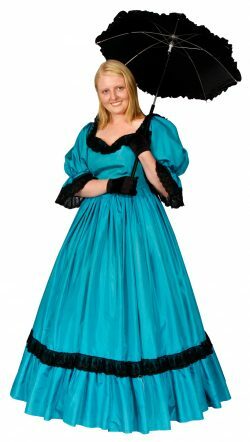 Blue Victorian dress with black lace trim and crinoline. Pale blue muslin Victorian dress with small flowers and crinoline. Victorian blue shot silk dress with crinoline petticoat. Victorian cream silk dress with crinoline petticoat. 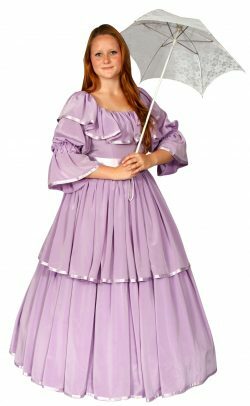 Lavender Victorian dress with ribbon trims comes with a fitting crinoline. 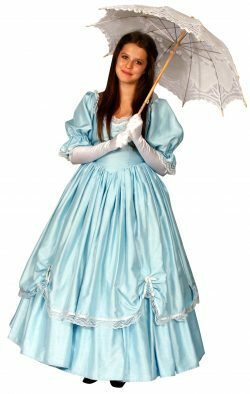 Pale blue Victorian dress with crinoline. A beautiful costume perfect for heritage occasions. 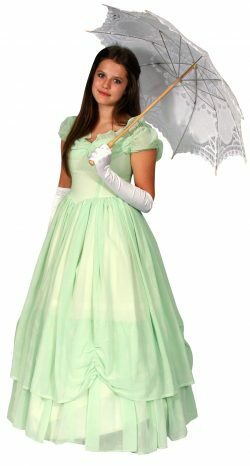 Pale green Victorian dress with crinoline. Pale pink floral Victorian dress with crinoline and matching bonnet.